Don't miss the Atlanta premiere of the brand-sparkling-new musical "Rocket Boys", based on the best-selling memoir of NASA engineer Homer Hickam Jr. Memorably translated to the big-screen in 1999's "October Sky" -- starring Jake Gyllenhaal, Chris Cooper and Laura Dern -- the inspiring tale of a coal-miner's son, who surrounds himself with initially skeptical friends as he pursues his dreams of rockets and space travel, now makes its way to the stage of the Legacy Theatre. As if the story wasn't already uplifting enough, it's now fueled by stirring songs that are sure to send its moving story into the stratosphere. 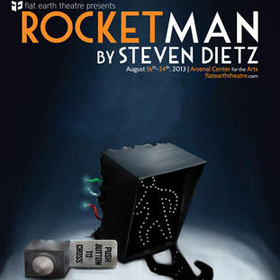 The Legacy was hand-picked by Hickam and the show's authors as the testing grounds for a potential run on Broadway -- so make sure you see it in town before a ticket to "Rocket Boys" also requires a plane ticket to New York City.